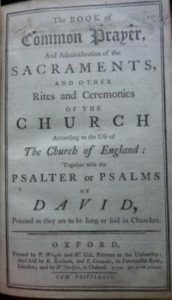 This Common prayer book, published in Oxford in 1770 comes down the family from Mary Shaw-Hellier (b 1801) through her daughter Sarah Evans to Molly Evans. It has a couple of looseleaf inserts that are of interest. First it is inscribed “Mary Shaw-Hellier 17 November 1789”. This we can take indicates that it was owned by Mary Shaw-Hellier (nee Shaw) the wife of Rev Thomas Shaw-Hellier. The Shaw-Hellier name only came into being in 1786 when the Shaw family first moved to the Wodehouse Wombourne as a result of the inheritance from Sir Samuel Hellier. 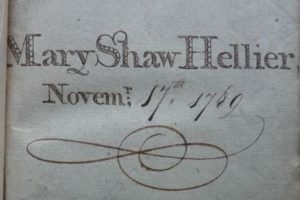 Until the significance of the date of 17 Nov 1789 can be interpreted there has to be the possibility that it belonged to another of the Mary Shaw-Helliers in the family. Mary had a daughter called Mary born in 1763 who was not to marry the Rev Yates until 1806. Also the wife of Mary’s second oldest son Thomas was also a Mary Shaw-Hellier, but they were probably married several years after this date, albeit in Oxford. It is believed that Mary Shaw-Hellier (b 1735) died in about 1806 and the most likely scenario is that the book was passed to her granddaughter and namesake, at her death. 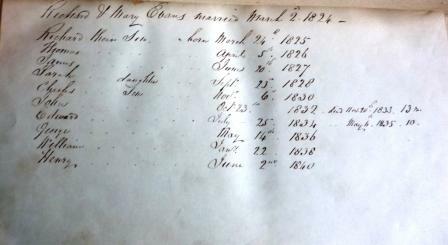 The second insert is the list of births of the granddaughter Mary’s children with her husband Richard Evans, married on 2 Mar 1824. 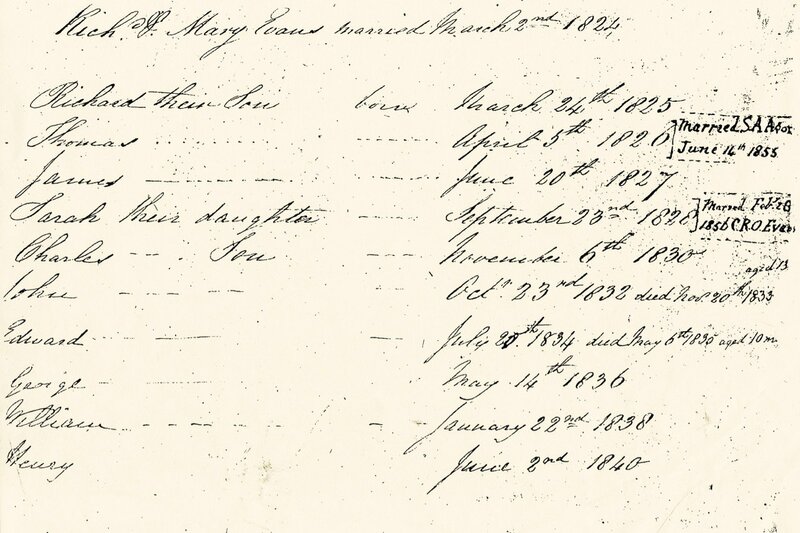 This list appears to be copied direct from the main Evans family bible and could have been transcribed at a later date. It is probably in the hand of Mary Evans (nee Shaw-Hellier), herself.